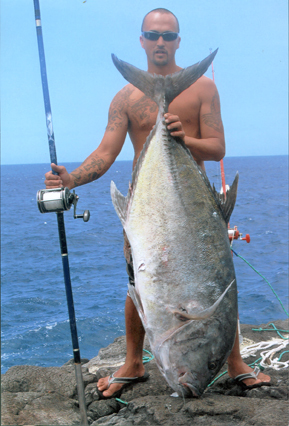 Scott Burns was competing in the 2008 Pole Benda Fishing Tournament and trying his luck on the Ka'u Coast of the Big Island when he hooked his massive ulua. The fish tested Scott's 13-foot Slyder pole, Newell S550 reel and 80-lb test Trilene to its limit, but eventually succumbed. Scott's catch earned him top honors in the tournament.